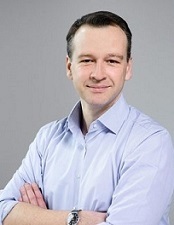 Arne Thomas (born 1975) studied chemistry at Justus-Liebig-Universität in Gießen, Philipps-Universität in Marburg and at Heriot-Watt University in Edinburgh. He completed his PhD with professor Markus Antionietti at the Max Planck Institute for Colloid and Interface Science in Potsdam. Subsequently he was awarded an an Alexander von Humboldt grant and worked as a postdoctoral fellow at the University of Santa Barbara, California, in the group of professor Galen D. Stucky. In 2005 he returned to the Max Planck Institute to work as a group leader and scientific coordinator of the "Enerchem" project, a collaboration of five Max Planck Institutes for the development of nanochemical concepts for a sustainable energy supply. In 2009 he was appointed a full professorship at the Technische Universität Berlin at the department of Inorganic Chemistry for functional materials.